If the NFL cares about Latino fans, why hasn’t it taken a stand on DACA? In February, the NFL warned the state of Texas that the passage of SB-6, a bill aimed at circumscribing transgender access to bathrooms and changing facilities, could affect the league’s willingness to host major sporting events in the Lone Star State. With the league’s swift response to SB-6 as a blueprint, the NFL must repudiate the Trump administration’s recent elimination of the Deferred Action for Childhood Arrivals (DACA) program, irrespective of its tenuous and uncertain schedule of implementation. DACA is an Obama-era initiative shielding from deportation close to 800,000 undocumented migrants brought to the United States as children. 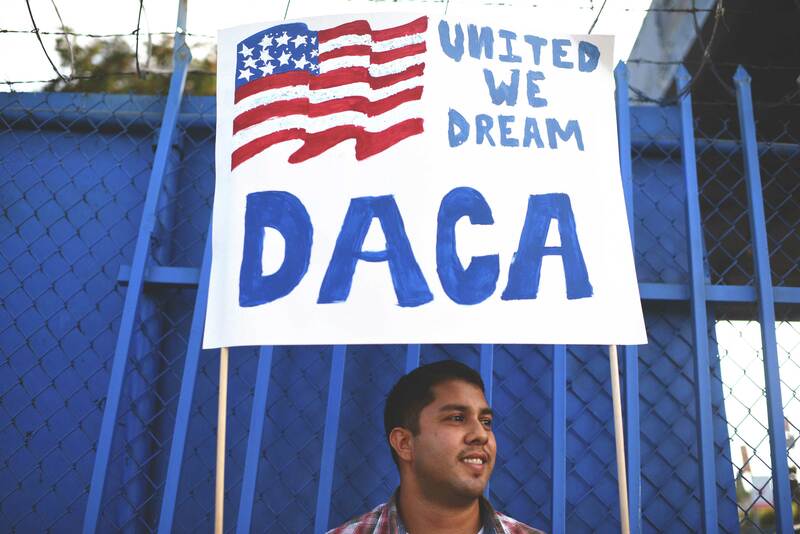 Most DACA beneficiaries are Latino, with 79 percent born in Mexico. Deferred Action for Childhood Arrivals recipient and appliance repair business owner Erick Marquez holds a sign during a protest in support of the program. Based on the league’s professed commitment to attracting the Hispanic fan base and expanding its market in Mexico, as well as the NFL’s partnership with the Hispanic Heritage Foundation (celebrating the contributions of Latino leaders in each NFL market), anything short of an unqualified rebuke of DACA constitutes an exercise in hypocrisy. In 2002, then-NFL commissioner Paul Tagliabue launched a league task force to learn more about “the Hispanic fan base” that in 2005 culminated in a game in Mexico City between the Arizona Cardinals and San Francisco 49ers. That game, the NFL’s first international regular-season contest, attracted a crowd of 103,467 fans, a figure far exceeding the league’s current average regular-season attendance of 68,400. Mexico is said to have an NFL fan base of approximately 23 million people, making it the largest market outside of the United States. Arturo Olivé, the managing director of NFL Mexico, estimates that the league’s fan base has expanded by 300 percent over the past decade, making American football the No. 2 team sport in Mexico, behind soccer. While the NFL has yet to take a stand on the injustice of eliminating DACA, even as the Trump administration weighs its possible reinstatement, it is clear that the league continues to attempt to ingratiate itself with its Latino fans. Over the past decade, the NFL has sought to expand both its Mexican and U.S.-Latino fan bases; it sees such growth as a prudent investment strategy. Specifically, it has been leveraging California franchises, often Bay Area teams, as prime-time players in an effort to expand the Latino fan base on both sides of the U.S.-Mexico border. Possibly because of its close geographical proximity to Mexico, or the fact that California is home to the largest Latino population in the United States and the largest volume of DACA recipients, the only regular-season games the NFL has held in Mexico have included the San Francisco 49ers (2005) and the Oakland Raiders (2016). Building on the success of the 2005 and 2016 games in Mexico, the NFL will return to Mexico City this season when the Raiders host the New England Patriots at Estadio Azteca on Nov. 19. “Being a bridge to American culture” means opposing the elimination of DACA. Leveraging its socioeconomic power and cultural capital in service of fairness, inclusion and opportunity is one way the NFL can squarely confront the great injustice being done to members of the Latino community. If the NFL truly sees the Latino community as anything more than a mechanism to expand its bottom line, then the league needs to take a forceful stand opposing the elimination of DACA. Ameer Hasan Loggins is a Doctoral candidate at UC Berkeley teaching courses in the Sociology Department at Mills College. He is a regular contributor to the African American Intellectual History Society's Black Perspectives, and The Athletic. He has a drip...drip...drip...splash jumper on the hoop court. Christopher Petrella is a lecturer in American cultural studies at Bates College. He is a regular contributor to The Washington Post and in 1998 – at the age of 14 – was named the MVP for the Jim Calhoun Basketball Camp.